Below I have listed a 4 step solution to send MsWord or PDF or other types of Document Attachments with Oracle Workflows Notifications. Using this simple technique, you can generate email notifications with attachments for Word or PDF or any other binary objects. Oracle has made sending such documents as attachments with notifications very straightforward. In the below example, I am assuming only one attachment per notification. However, you can create as many Attachment attributes you wish, and also can programmatically control how many attachments are sent per transactions. 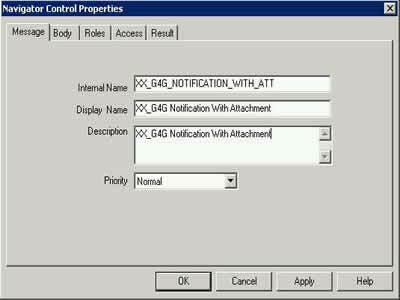 Anyway, below are four simple steps for sending Workflow Notifications with Attachments. 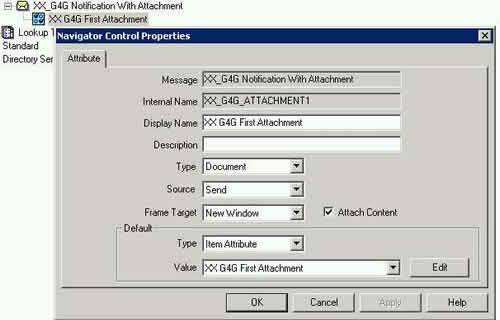 As in the picture, workflow Message “XX_G4G Notification With Attachment” is defined. This message will be referenced by the Notification that sends either MsWord or PDF or any other binary attachment as email. If you had dragged the Attribute from Workflow level into this message, then default sub-section will be populated automatically. Please note the manner in which parameter documented is assigned. The syntax is PLSQLBLOB:<package name>.<procedure name>/<unique id to identify binary file> . In my example, I am capturing the file_id from fnd_lobs. In your case this ID will be derived depending upon whether you are looking for PO Attachment or say an attachment to Oracle Sales Order or a Resume in iRecruitment or some course notes in oracle Learning Management. Note 1. In step 3, the value of Unique File id that is passed in after / gets translated into document_id in step 4. This translation occurs within the workflow engine, when it splits the pl/sql name from parameter. Note 2. Proecdure xx_notif_attach_procedure must be defined in the package specification too. Note 4. The value from the Oracle Blob column is fetched into blob variable bdoc from fnd_lobs. Note 5. Next you can use dbms_lob.copy to copy the value from blob variable into out parameter for notification. Thanks for reading this article. Kindly share this knowledge with your colleagues as this happens to be a very useful feature of Oracle Workflows. You have subscribed to the event that gets fired after IRC vacancy creation. This Workflow subscription is then send notification with attachment. Now to answer your question, well it is answered in Step 3 in this article. After the package dot procedure name you are passing the File ID from which blob can be derived. I guess IRC uses its own table to store those attachments[does not use FND_LOBS]. THe document id in this case will be the id that you assign to the attribute[of type document]. ii> how exactly package specificatin & body for xx_g4g_package will look like. i will be very greatful if you can tell me, i am ref. this article for sending an attachment through notification after creation of vacancy in the irecruitment. I tried this in 11.5.8 and i got the following error when i clicked on the attachment icon in the notification. I have created the procedure as myprocedure1 and passing the constant 10.
but in the error stack i could see only the document URL. Do i need to do any setup? How do I customize this?? Can you help us please.. This is due to the Workflow Message Attribute. It appears that either the attribute does not have 'PLSQLBLOB....' or the OUT parameter is not of type BLOB. You can also have a look at API irc_notification_helper_pkg, within which procedure show_resume is used. You can base your example on that, as iRecruitment uses this API to attach resumes with notifications. This is a great document. I have used the same to send the output of a concurrent program to an intended user using the above method. But When I am send the notification I am getting the following error. Would you please help me in getting the problem solved. A-->B-->C, over here 'A' is the initiator 'B' is the FYI reciever and 'C' is the final approver, i need to design the process so that when 'A' enters some comments it should be visible to 'B' and when 'B' enters some comments 'C' should be able to view all comments i.e. given by 'A' and 'B'. Please provide some information on the approach basically i am unable to carry forward and write comments. I need to send a report output as an attachment in WF (XML publisher output). I have got the request id and the path of the output file. But Now I am unable to send this output file as an attachment to the user using WF. I can send the URL(link) using fnd.request.add_notification() but I need to send it as an attachment. How do i find the path where concurrent program output PDF is stored. here u have used fnd_lobs. How can i capture , concurrent program o/p file here. Max size of Notification content. I have a question related with normal workflow notifications. Can i send more than 32k size message as a notification's content. Error Message = [WF_ERROR] ERROR_MESSAGE=3835: Error '-20002 - ORA-20002: [WFMLR_DOCUMENT_ERROR]' encountered during execution of Generate function 'WF_XML.Generate' for event 'oracle.apps.wf.notification.send'. while trying to attach PDF documents(PLSQLBLOB) to the notificatons..any idea what can be possible causes for the same. I want to send FYI and approve notification for vacancy approval. My Req is once some approve vacancy i need to send FYI to third person. I have workflow working already for vacancy approval. What i need is when some one approves vacancy, it should send FYI to third person. So i can add this req in existing workflow so that i can achieve FYI notification along with approvals. I've one more doubt again. How we are putting the data into FND_LOBS Table? i.e any api which I can use to insert data into FND_LOBS. I have data in one table and will be sending notification based on data in it. Now as soon as notification is send we want to delete the records in table. I tried using CLOB for it. But as soon as records gets deleted previously send notifications also fails to open. So I thought if I can put my data in FND_LOB as some rtf file and will base my attachment procedure to fetch the data from FND_LOBS and for this I need an api to insert the data into FND_LOBS. The concurrent program output path can be retrieved from fnd_concurrent_requests table. The column name is outfile_name.